Ever since the Playstation Generation was allowed to legally import R32 Nissan Skylines under the 25-year-rule, we have seen scores of them wash up on our shores. That’s great. That’s fine and wonderful. Soon, we estimate 30 percent of all cars on American roads will be Skylines. 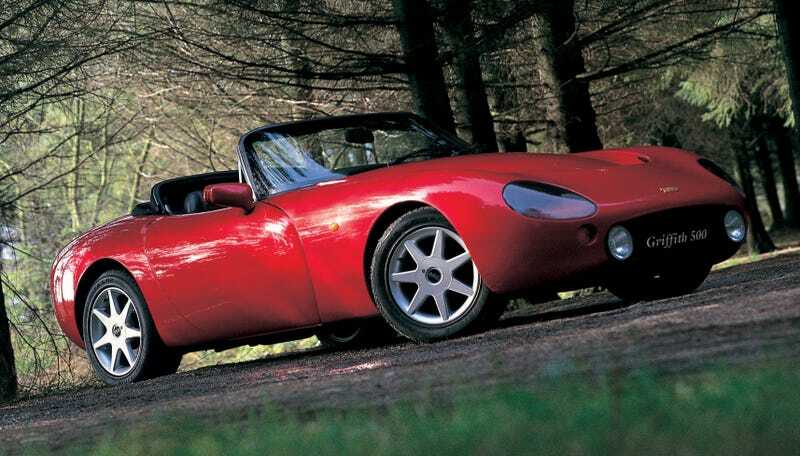 But also, like, you know you can import the TVR Griffith too, right? We’ve been able to get TVRs in America for some time now, but those have all been the muscly 1960s and ‘70s models or the blocky 1980s models. The Griffith got sleek for the ‘90s, with an almost comical lack of styling that still looks new today. Does it look good? Sure! Does the back of the car look kind of like TVR ran out of time halfway through drawing it? A bit! All Griffiths, made from 1990 all the way to 2002, came with a version of the long-lived Rover V8, which had a fantastic collector exhaust directed to the front. It’s a body-on-frame design and the body is fiberglass. Horsepower for most of the early cars was between the mid 200s and the mid 300s and weight was around 2,400 lbs, which is wonderfully low. Now, sure, Skylines are some of the best-built performance cars that a person can buy, with legendary reliability in everything from their straight-six engines to immaculate build quality elsewhere. TVRs by contrast are like the British version of the Dodge Viper. That’s it, isn’t it? You are all scared it’s gonna break down. But cars don’t need to make sense! Certainly not TVRs. Be bold, friends, and dumb.